SPTargets Turning Target Frames are injection-molded using a tough, UV-resistant filled-nylon material. They are designed to hold easily available 1”x2” wooden uprights but can be adapted to use 2”x2” uprights. The frames will accommodate backers up to 24” wide. UV-resistant filled-nylon frames reduce the risk of dangerous ricochet. Electroplated steel pivot shafts secure the frame to the base with a tool-free "push-tun-click" positive action, and can be removed in seconds, again without tools, to permit frame removal or replacement. Industrial plastic bearings between the frame and pivot shaft remove the need for periodic lubrication. This is of particular benefit in dusty environments where lubrication of bearing surfaces is actually detrimental. Target frames are interchangeable between turning target systems and the Running Man system. Frames are tough enough to survive repeated bullet impact, and easy and cheap to replace when necessary. 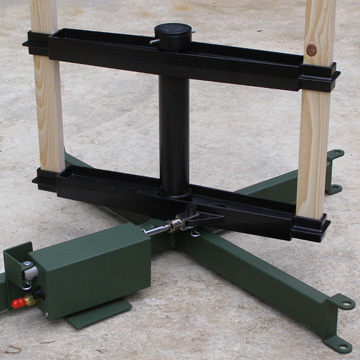 In portable systems, frames are quickly and easily removed to permit stacking of bases for storage or transport. Turning frame: Extremely tough, computer-designed, injection-molded filled nylon. Pivot shaft: Electroplated steel capped with a milled nylon shaft cap. Optional target frame extenders: Machined aluminum target frame extenders accommodate a variety of specific backer widths. Water, extreme/varying temperature, and UV-resistant. Replaceable, industrial nylon bearings are press-fitted into the frame tube. Replaceable, industrial nylon bearings are placed between the base and frame.